Prominent & Leading Wholesale Trader from Mumbai, we offer acs panel, led spotlight with philips led light engine and assembly for construction sites electrical panel with stand and canopy and mcb. 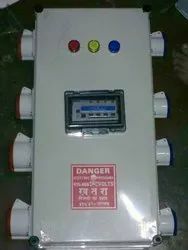 We Wel-lite electricals & electronics private limited have been counted amongst the most trusted names in this domain, engaged in providing ACS Panel. A very versatile unit with customized solutions like mcb, switchgear as per requirement, plug and sockets, push button station and any other requirement as per application. portable and long lasting reusable. one time investment and can be reused at different construction sites. shock proof , insulation proof, corrosion proof, and modular in construction. can add extra boxes as per requirement.